Help Us Restore this Cobra, as we honor the ones who flew them in times gone by. On March 11, 1966, Bell helicopter won the competition to meet the Army’s immediate need for an attack helicopter. 50 years later, we are seeking to bring this specific aircraft you see above, back to life, so we can fly it during our 2017 flying season as the 50th Anniversary Cobra. Cobra Serial #66-15295 (sitting in our hangar, above) flew approximately 1742 combat hours in Vietnam , with assignments to D troop 229th Aviation Battalion, A troop 7th Squadron 17th Calvary and the 361st Assault Helicopter Company and participated in Desert Storm with C troop 2/17th Cavalry. It will be configured with a curved canopy and weapons systems initially installed on the aircraft. Make a Restoration Donation today in memory of someone you know! 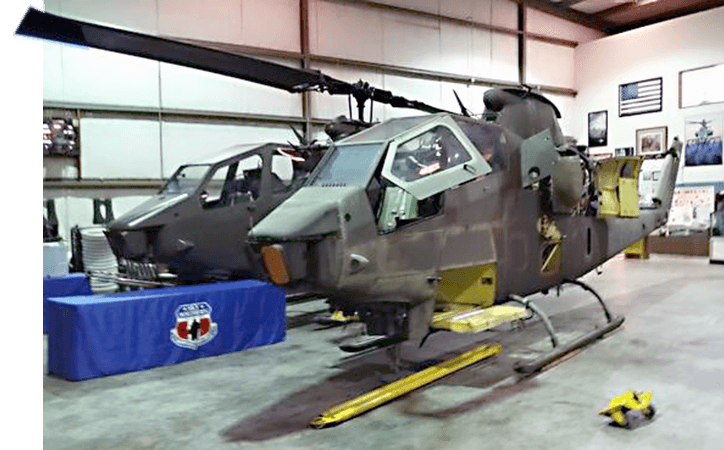 In 1966, design Engineer Mike Folse and his team of Bell engineers brought the aircraft to life as a UH-1G…subsequently to become the AH-1G and the Army’s first attack aircraft. On April 13th, 1966 the first order for 110 AH-1Gs was delivered to Bell and subsequently in August of 1967 was fielded in Vietnam by LTC Anderson (Nett). One of those aircraft, 66-15295 was part of the initial group and was actually the 50th Cobra delivered to the Army. This marvelous aircraft sits in the AAHF warehouse. Restoring it will be a tremendous tribute to the U.S. Army, Bell Helicopter and the aviators who flew this aircraft. Help Us Restore this Cobra, as we honor the ones who flew them. Join the restoration team by making a donation today!